WARNING: When filling out this form please do not hit your browsers BACK BUTTON. All of the information that you have entered will be lost! We recommend that you have your bank/credit union's routing number and your checking/saving's account number before completing this form. Your bank information will be required if you would like to have the $200 security deposit waived. Please note that if you want an individual to have access to account information they must be listed as an applicant on this form. Date you would like utilities taken out of previous owners name and put into your name. Please sign in no sooner than 1 month in advance. * Driver's License - Issued by one of 50 United States * State ID * Passport - Issued by the United States of America * I don't have a Driver's License State ID, or Passport. If you do not have a United States Driver's License, State ID, or U.S. Passport you are required to come into the City Office to sign in for Utilities. Please STOP filling out this application and come to the Spanish Fork City Offices located at 40 South Main. If self, list business name. If Retired, type Retired, If Unemployed, type Unemployed. Yes No If you would you like anyone else (i.e. spouse, etc.) to be able to make inquiries & changes to your utility account you need to add them as a Joint Applicant. By signing the RESIDENTIAL UTILITIES CONTRACT which is also part of this form you are also agreeing to the terms set forth in this LANDLORD AGREEMENT FOR CONTINUTED SERVICE. Yes No Co-Signer must be a homeowner in Spanish Fork City and have a satisfactory payment history with the City. By having a co-signer you will not be required to post a deposit. Do not complete this field if you do not have a co-signer. Co-signer must be a home owner & have a current SF City Account w/ good payment history. Please select additional services you would like to receive. Spanish Fork City has its own Internet, Phone and Cable TV company and saves residents over $3 million per year vs. competitors. 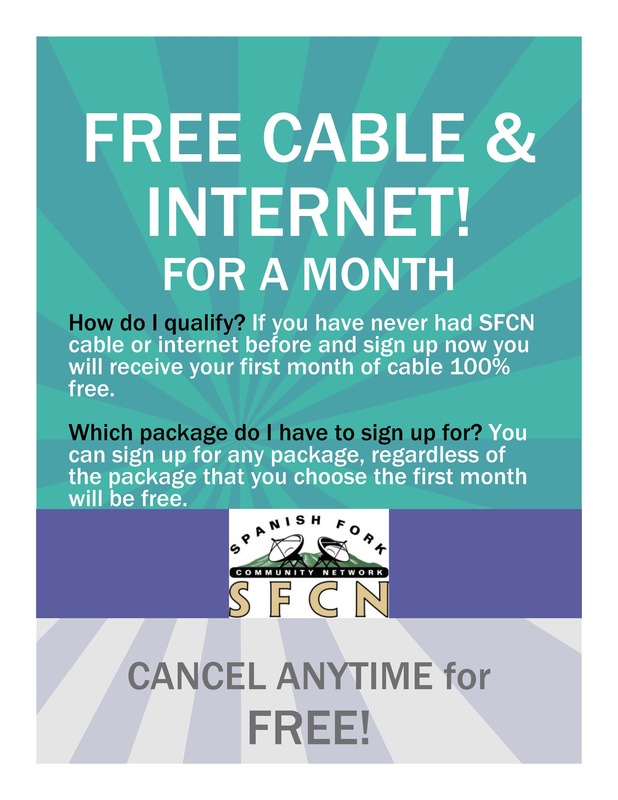 Spanish Fork now offers the fastest technology available with Fiber-To-The-Home! Click here to see if it is available today for your home. Mandatory Services (please note your Landlord or HOA may pay for some of these services): Residential Electric, Pressurized Irrigation (may be exceptions), Storm Drain, Culinary Water, Sewer, Garbage. Services shall be provided in accordance with State law and municipal ordinances and resolutions as requested on the setup form at rates as established by ordinance or resolution of the Spanish Fork City Council provided that city shall not be responsible for failure to deliver services by reason of strikes, accidents, acts of God, weather conditions, natural disasters - whether declared or undeclared, state or other governmental regulations or any other act, contingency of bar beyond city's control. 2. CUSTOMER shall pay such fees and deposits as shall be established by the city and shall further be subject to termination of services upon non-payment or failure to comply with rules, regulations, ordinances or laws as established by the city. CUSTOMER acknowledges and agrees to pay minimum water charges, and minimum electric charges, even in the event that the premises are vacant for extended periods of time, provided that CUSTOMER may eliminate minimum electric and water charges only by requesting the city to terminate service. In such event, CUSTOMER agrees to pay a reinstatement fee, as set by the city, to restore electric power service and water services. Utility deposits will be held without interest for an indefinite period of time. CUSTOMER agrees to be bound by the utility policy of the city and also the terms and conditions of the Rate Schedule and to pay applicable rates as established by the city council. A tenant deposit is held until tenant moves. At that time, it will be applied to the account, and any unused portion will be refunded. A homeowner who fails to post a deposit when requested is subject to termination of service. In the event payment is late, a 5% late fee will be assessed. There will be a charge on all returned checks in the maximum amount allowed by state law, and CUSTOMER agrees to pay the same. Utility service is subject to city ordinances and policies established by the Spanish Fork City Council. 3. The City requires free unobstructed access to electric, water and pressurized irrigation meters at all times. 4. CO-SIGNER does hereby agree and is hereby bound and is equally liable with CUSTOMER to pay the city any amounts billed pursuant to this agreement. 5. In the event CUSTOMER defaults in payment, CO-SIGNER agrees to give the CITY the right to attach any delinquent amounts to CO-SIGNER'S personal utility account. CO-SIGNER'S utility service will be subject to disconnection if acceptable arrangements are not made with the CITY to pay off said delinquent amount. 6. In the event this account is placed with an attorney for collection, either with or without suit, CUSTOMER and CO-SIGNER shall be responsible for all court costs and reasonable attorney's fees incurred thereby. 7. In the event this account is placed with a collection agency for collection, CUSTOMER shall be responsible for all collection costs incurred including a collection fee of up to 40%, pursuant to the provisions of Utah Code Ann. §12-1-11. 8. CUSTOMER and CO-SIGNER, if any, hereby warrant and affirm that the information provided on this set up form is true and correct to the best of their knowledge. FAILURE TO PROVIDE TRUE AND ACCURATE INFORMATION MAY SUBJECT YOU TO CRIMINAL PROSECUTION UNDER UTAH CODE S76-8-504. Customer and co-signer also affirm, understand, and agree to comply with provisions of this utility contract. 9. Federal law requires that we establish your identity by accessing information in your credit report. By submitting this application you are authorizing us to obtain information from your credit report to validate your identity. What city were you born in? What is the name of your favorite pet? What was the name of your High School mascot? What was the make and model of your first vehicle? Where did you meet your spouse? To verify your identity when making future inquiries about your account the answer to a Security Question may be required. All CUSTOMERS both tenants and home owners shall be required to post a minimum $200 deposit*, obtain a satisfactory co-signer, or have had ten years of prior city service with a satisfactory payment history as either a homeowner or tenant. If non-satisfactory deposit is made at time online application is submitted Spanish Fork City reserves the right to require resident to pay additional deposit before residents utilities will be turned on. *CUSTOMERS that sign up for Auto Pay through Spanish Fork City (not third party i.e. Bank Bill Pay) by completing the Auto Pay form on the following page below will not be required to pay the $200 deposit. In the event that CUSTOMER cancels Auto Pay or has ACH payment rejected for insufficient funds CUSTOMER will immediately be required to pay $200 deposit, will be taken off of Auto Pay, and may have utilities shut off. CUSTOMERS must sign up for Auto Pay within 5 business days of their original sign in date to avoid the $200 deposit. CUSTOMER must also abide by all standards setforth in the Utility Office Customer Deposit Policy. **CUSTOMERS that fail to return equipment within 48 business hours of cancellation will be billed for the full price of the equipment. In the event that equipment is eventually returned to the City, CUSTOMERS will be issued a credit for the previously billed equipment less the standard monthly equipment rental premium multiplied by the # of months between the cancellation date and the date the equipment was returned with a minimum charge equivalent to one month’s rental fee. I acknowledge that I have read the information regarding the Utility Set Up Fee & Deposit. Yes No If you elect not to enroll in Auto Pay you will be required to post a $200 deposit. Over 70% of people choose this option. I hereby authorize Spanish Fork City Corp. to initiate automatic withdrawals from my account at the financial institution named below. I understand that payment will be deducted from my account on the 20th of each month or the following business day if the 20th is on a weekend or holiday. I understand that I am responsible to pay a returned item fee of $20 as specified by the City for any automatic debit that is returned to Spanish Fork City for any reason. In addition, I understand that I will be removed from automatic withdrawals and that a $200 deposit will be required. Further, I agree not to hold Spanish Fork City Corp. responsible for any delay or loss of funds due to incorrect or incomplete information supplied by me or by my financial institution or due to an error on the part of my financial institution in withdrawing funds from my account. This agreement will remain in effect until Spanish Fork City Corp. receives a written notice of cancellation from me or my financial institution, or until I submit a new/updated Auto Pay form to Spanish Fork City. I understand that if I make a payment using another payment method (i.e. in office with cash or check or online with a card) after the 15th of the month, my automatic payment may still be deducted on the 20th by Spanish Fork City and I assume responsibility for any bank/credit union fees that may result. Yes No If you are moving from one address in Spanish Fork to another address in Spanish Fork and would like to cancel your current utility account please select yes.